Systempool is one of the eight firms which make up PORCELANOSA Group, in charge of commercialising the Krion® Solid Surface. Within the KRION line we can distinguish two commercialisation channels, KRION Bath and KRION Solid Surface. In the latter, sheets, semi-manufactured products, products awaiting transformation, washbasins, sinks, shower trays and bathtub bases are commercialised. KRION Bath commercialises final products, bathtubs, shower trays and countertops, etc. Today we wish to present the ARCH freestanding bathtub made with KRION, among the products of KRION Bath. 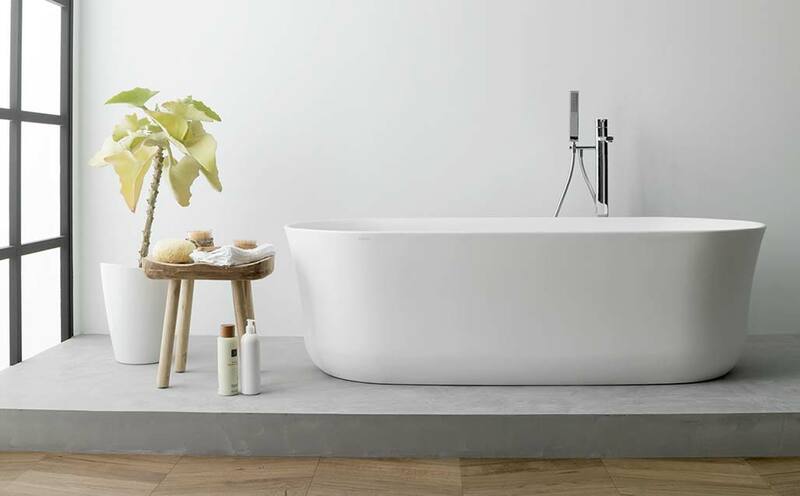 It is a freestanding bathtub with an oval shape, available in two sizes, 160x75 with a single back, and 170x75 with a double back, both with a centred click-clack drain, finished with KRION, with an integrated overflow.